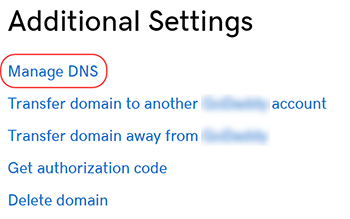 You can create a subdomain record in your DNS (Domain Name System) zone file for a domain registered with GoDaddy. Subdomains use a domain prefix, such as pics.coolexample.com, to point to an IP address. To add a subdomain that points to a domain name or URL, you can add a CNAME. To manage DNS for a domain not registered with GoDaddy, you can use DNS hosting. Select A from the Type drop-down menu. You can edit an existing subdomain record to change any details. Or you can delete a subdomain record if it's no longer needed.